Our second day trip destination from Catania was Taormina, 48km to the north. 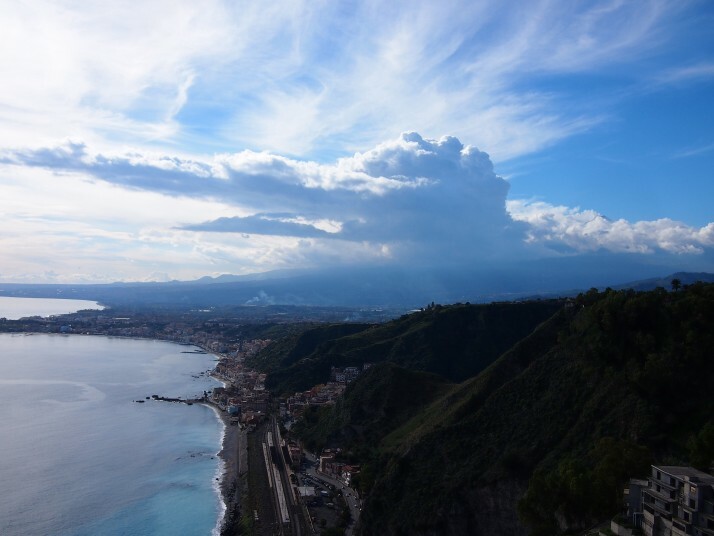 It’s possible to make the journey either by bus or train, but we decided on the latter enjoying the views of the sea on one side and Mt Etna on the other as the train wound its way along the coast. From the old-fashioned 1920s railway station we followed the road beside the tracks. It was a bit further than we expected but eventually we arrived at the bay and beach below the town. 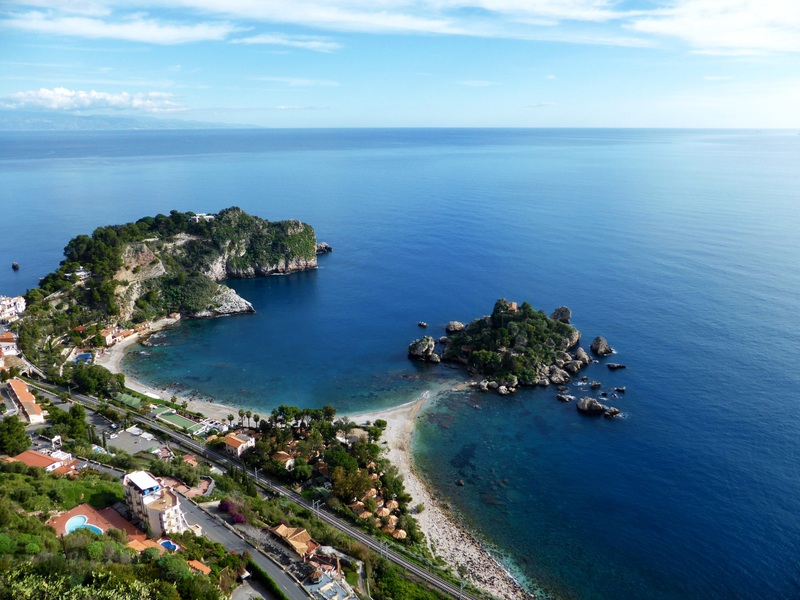 In the middle of the bay is a small island called Isola Bella (literally Beautiful Island) which is linked to the beach by a pebbly causeway with waves crashing over it. It didn’t look deep from above but, when we got closer, we saw that it would be over our knees so we didn’t attempt the crossing to the island which is now maintained as a nature reserve. 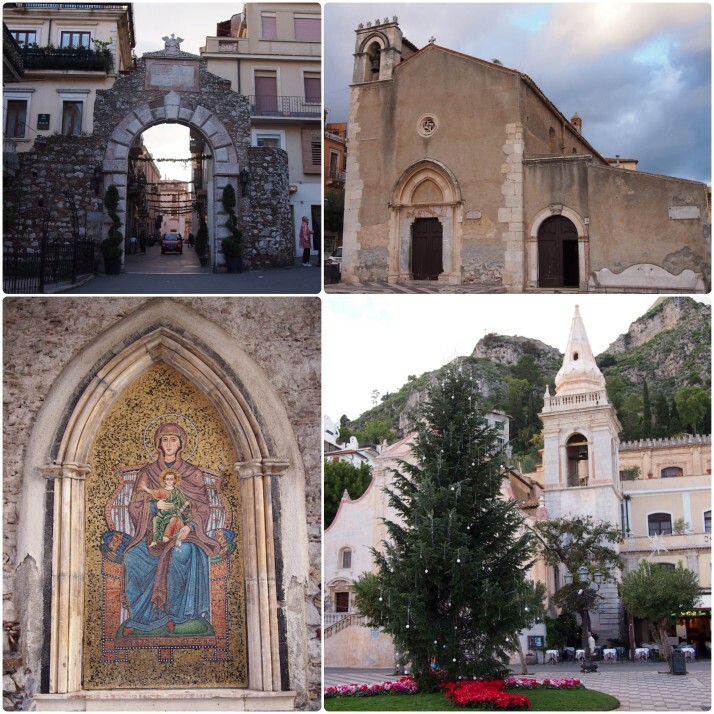 Taormina has been on the tourist trail for a long time, being a popular stop off for rich young Europeans doing their Grand Tour (the 17th-19th century version of a gap year). Nowadays it is a popular beach resort in the summer although the beach is neither large nor sandy. From the shore it was a long climb up the stairs into the town itself but it was worth it for the fantastic views and a fly past from a large propeller plane. By the time we got to the top we were ready for a sit down and something to eat so we found a comfortable bench in the public park, Giardini della Villa Comunale, where we could relax and eat our sandwiches. The gardens were originally built for Lady Florence Trevelyan, an Englishwoman and cousin of Queen Victoria who was born in Newcastle-upon-Tyne. 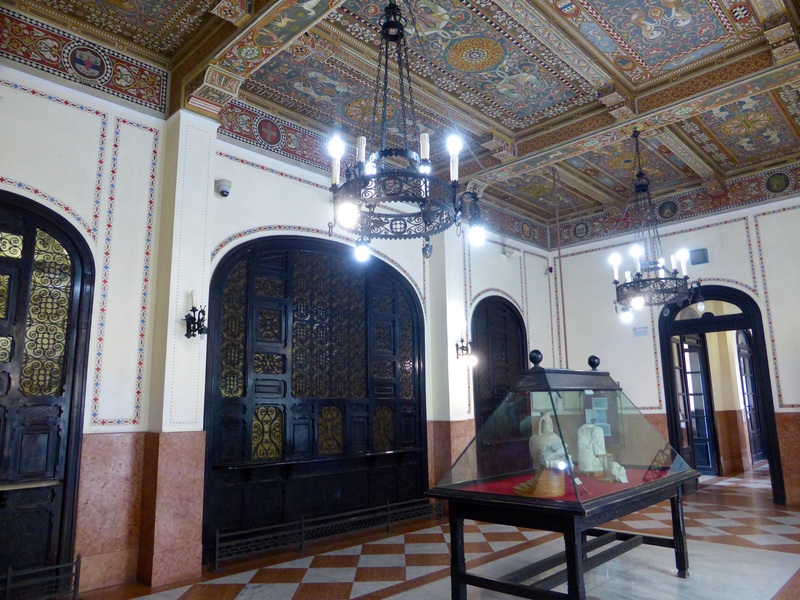 She lived in Taormina from 1884 until her death in 1907, marrying the mayor in 1890. She was a bird lover and the park contains several brick-built “follies” intended as bird houses. 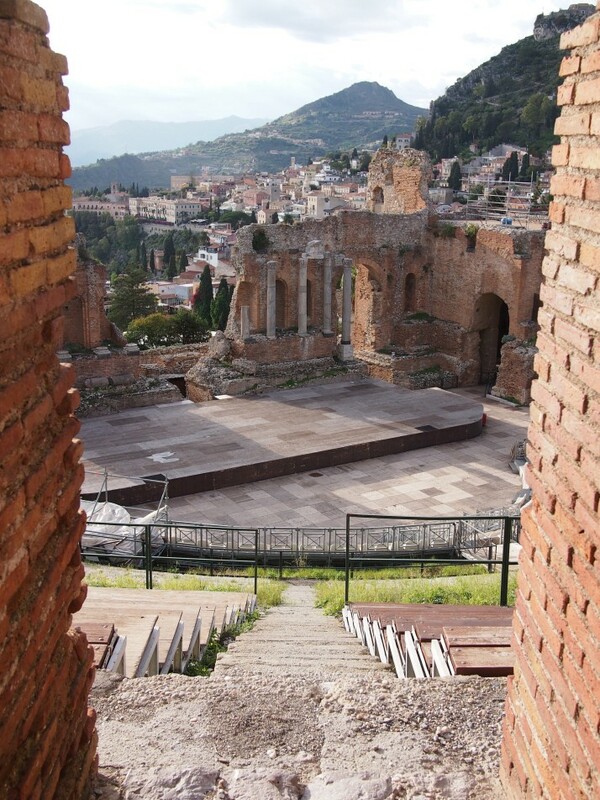 Taormina’s most famous sight is its theatre. 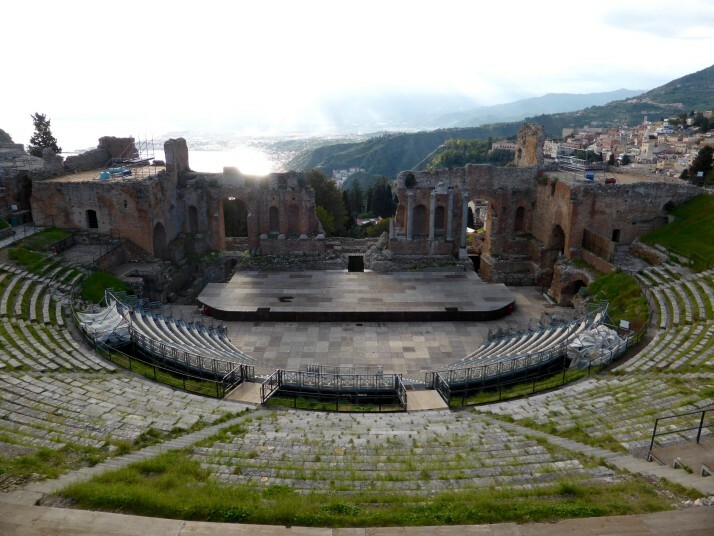 Similar to the Teatro Romano that we had seen in Catania, this one is bigger and has a superb location perched over the town with views up the coast and Mt Etna towering behind the stage (when it’s not shrouded in cloud). The theatre dates to approximately the 3rd century BC but, like the one in Catania, it was almost completely rebuilt by the Romans in the 2nd century AD. 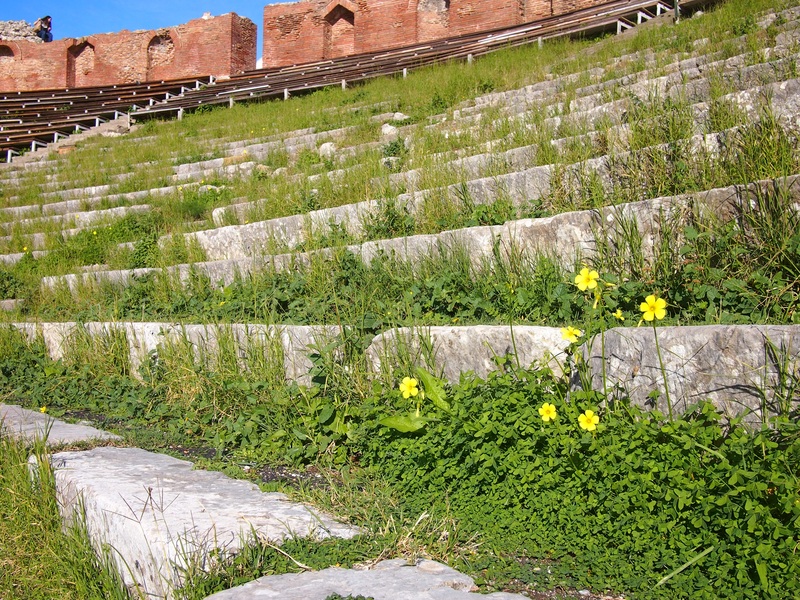 In the summer all kinds of cultural events are still performed here, everything from opera to jazz to James Blunt! Hence the wooden stage and rows of plastic folding seats which somewhat detract from the grandeur of the place though it must be an amazing backdrop for a performance. Descending back into the town we wandered along Corso Umberto I, its main street, checking out the various old gates and ancient churches, as well as window shopping in the boutiquey tourist shops which were just opening up for their evening hours. Halfway along we stopped for a gelato, something that we’d been looking forward to for weeks – Italian gelato being far and away the best ice cream in the world (fact not hyperbole). Foolishly we both opted for the medium sized scoop of chocolate fondant flavour. It was just as amazing as we’d expected, but by the time I’d finished such a large portion I was feeling a little chilly in the late winter afternoon and it was so rich that I just wanted to find a corner where I could lie down quietly and moan to myself. 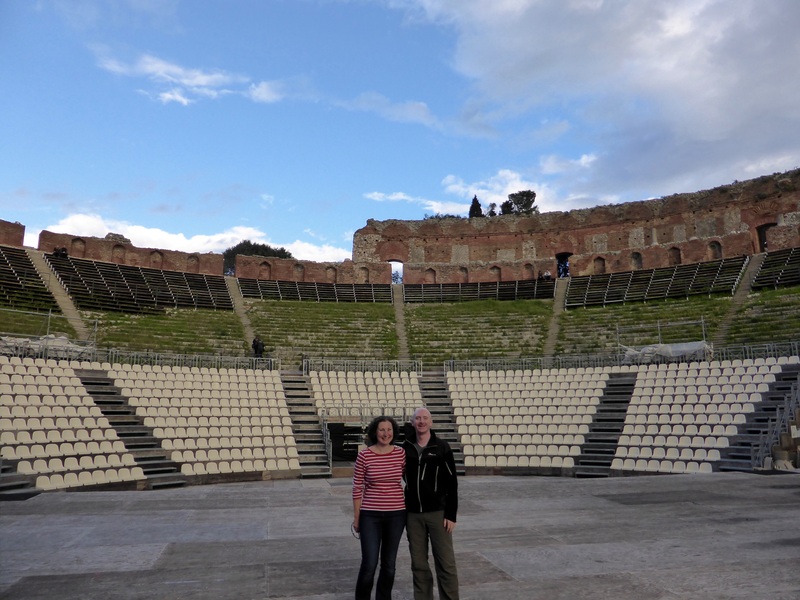 Maybe we should have picked up the gelatos before we went to the Teatro Antico and then we could have both had a nap! This entry was posted in Places and tagged Italy, Sicily, Taormina on December 29, 2014 by Julie. 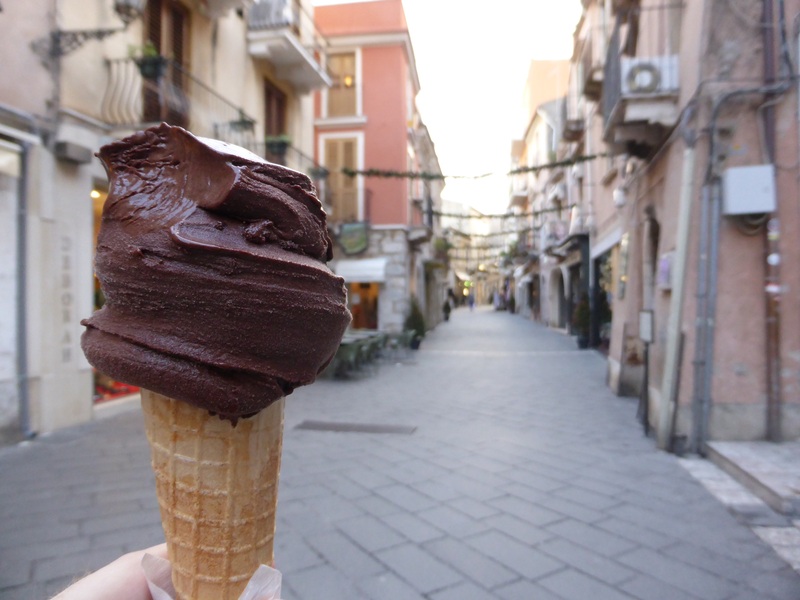 Despite having had pizza and chocolate brownie for lunch (with Emma and Sarah) I WANT that gelato, it looks incredible. 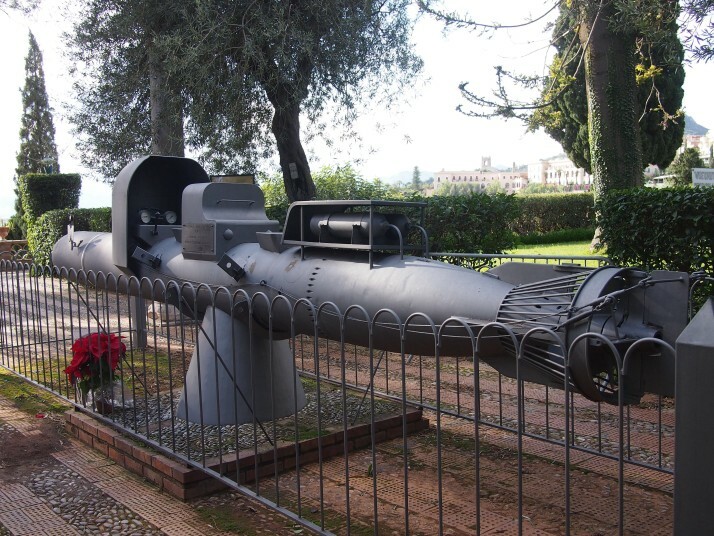 The guided torpedo is not as deadly to the divers as you might imagine. It seems very similar to the British version, where the torpedo is guided next to the target (usually a ship, but targets have included pipelines, piers, submarine pen gates, and anti-submariene nets) by the crew, who then dismount, disconnect the front (explosive) portion, attach to target (magnets or limpet system) set the timers and skedaddle on the motorised part before the big bang! There are/were a couple of these exhibited at Portsmouth dockyard, and somewhere a photo of Bob and I sat astride one (out of the water of course :0 ). What is 25 + 22 ?